Beginning with her harsh childhood in Nazi-occupied Holland, Warren Harris chronicles Audrey Hepburn's meteoric rise to Hollywood stardom: her chance encounter with Colette that led to the lead role in the Broadway version of Gigi, and her first starring role in Roman Holiday, for which she won the Academy Award for Best Actress. Hepburn played opposite the top leading men, worked for the best directors, and picked from a wide range of roles. She memorably embodied Truman Capote's Holly Golightly in Breakfast at Tiffany's and went from rags to Technicolor Victorian beauty in My Fair Lady. Warren Harris also traces Hepburn's affairs and unhappy marriages, as well as her later work as goodwill ambassador for UNICEF. Throughout the book he illuminates her special ability to exude grace and style, both on screen and off. 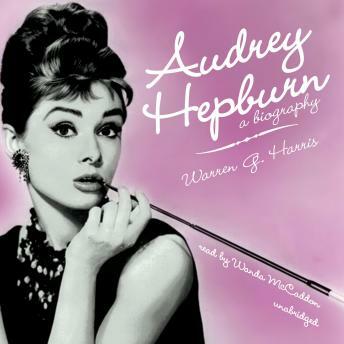 I am a big fan of Audrey Hepburn, so I thoroughly enjoyed this audio book. I could actually think the narrator was Audrey herself!! An easy "read." My favorite Audrey Hepburn movie is "My Fair Lady." What is yours? ?